David O. Russell has been on fire over the last handful of years, helping to make the likes of Christian Bale, Amy Adams, Bradley Cooper and Jennifer Lawrence household names with their superb performances in The Fighter (2010) and Silver Linings Playbook (2012), so the third time should be quite the Oscar-filled charm. These four actors take on the 1970s in all its big-haired glory with American Hustle, rife with cops and con men, espionage and elected officials, muddy marriages and mobsters with nary a minute to breathe. With all this going on in the film, the last thing you would expect is this to be billed as a comedy. But that’s what critics in America are categorizing this film as. The hapless geeks don’t want to paint that broad a stroke on this, though, so we’ll call it a seriously funny drama. The intent of American Hustle we don’t believe was meant to be a funny one, but you can’t help but start snickering when you are introduced to Irving Rosenfeld, Christian Bale’s character, or the antics that unfold throughout the film between him and his nemeses, the mysterious Sydney (Amy Adams), ambitious Richie (Bradley Cooper), goody-goody Carmine (The Town’s Jeremy Renner) and Irving’s lovelorn wife Rosalyn (Jennifer Lawrence). Truly watching the master at work, Irving does what all good con artists do—know how and where to make a swift exit as soon as they enter a room. Quick on his feet as well as with his words, Irving (and Bale) takes the audience on a ride that is well worth the price of admission. Russell, however, seems to treat this film as an homage to Goodfellas, but with questionable camera tricks and sometimes uneven balance between character development and plot focus. Hustle is very top-heavy as well, which leaves the ending particularly bland and unsatisfying. Through no fault of the actors, it seems they too were left hanging at the end, and got packaged into a safe, secure finale with a neatly tied bow instead of any number of acceptable (and deserved) outcomes the prologue was moving towards. But, as mentioned before, the journey towards that end was expertly crafted and executed—solidifying a nod to all four principals as Adams, Bale, Cooper and Lawrence have been nominated for the Best Lead and Supporting categories this year, as well as Russell receiving a nod for Directing. Jennifer Lawrence seems to have the clearest momentum for grabbing the golden statue out of the bunch, as this year’s Oscar class is quite formidable. With some real solid work from Renner and Louis C.K. in a very believable dramatic and comedic performance, Hustle is the type of film that will probably be praised years after its release, but not wholly appreciated at present. 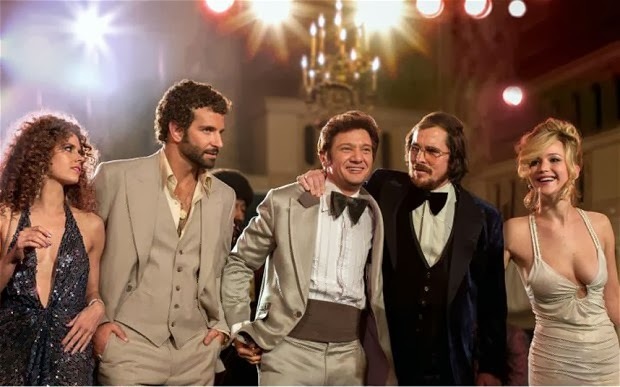 Adams, Cooper, Renner, Bale and Lawrence in American Hustle. American Hustle is a surefire rental, when it is released on DVD and Blu-ray later this quarter. 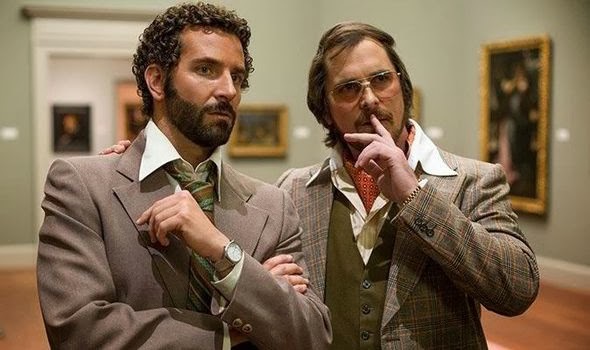 UPDATE: After coming up empty at this year’s Oscars, American Hustle is back for a limited time in theaters before it’s officially released on DVD and Blu-ray Tuesday, March 18.